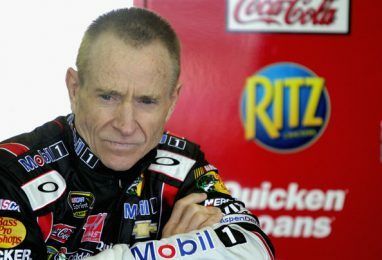 Mark Martin, a nominee for the NASCAR Hall of Fame Class of 2017, was the most recent NASCAR personality to endorse republican presidential candidate Donald Trump on Monday at the Cabarrus Arena and Events Center, located about 15 minutes from Charlotte Motor Speedway. Martin joins NASCAR CEO Brian France, NASCAR Hall of Famer Bill Elliott, and drivers Ryan Newman, David Ragan, and Chase Elliott as the racing cast to support Trump’s presidential run. According to Charlotte Business Journal’s Erik Spanberg, Martin went on stage at the event earlier today and said, “build that wall” — referencing Trump’s claim to build a wall separating the United States of America and neighboring Mexico. Martin, who has not competed in the NASCAR Sprint Cup Series since 2013 at Homestead-Miami Speedway in a substitute role for Stewart-Haas Racing, also said that he believes Trump will bring back jobs to America. Trump said during the event that both Elliotts were backstage, supporting his campaign again. However, the younger Elliott (Chase) tweeted a photo from Colorado on Monday after he raced in the Kobalt 400 at Las Vegas Motor Speedway on Sunday, the third stop on the NASCAR Sprint Cup Series schedule. After hearing about the latest endorser of Trump, NASCAR released a quick statement. “NASCAR has not and does not endorse political candidates,” they emphasized. Marshall Gabell is the Mid-Atlantic Correspondent for Race Chaser Online, and was also formerly the public relations director for NASCAR Next member Austin Hill. Gabell is currently attending Stephen Decatur High School in Ocean City, Md., completing his sophomore year. He is just 15 years old.